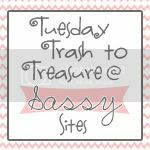 Since we didn't have a t2t party last week, I thought it would be fun to take some of my favorite Christmas t2t finds from around blogland. I LOVE how she used old yard sticks to make a stocking board! This is for sure on my to do list! How cute would this be after Christmas in a school room or to give for a teacher gift! I am obsessed with old windows! I love what she did to make this one perfect for Christmas decor! She just used regular white screw-in hooks and hung adorable ornaments on each hook. Too cute!! How CUTE is this! This is an easy gift or to use as your own Christmas decor, using a frame (you know Goodwill has those! ), old buttons from your button stash (you know you have one! ), and a few scrabble pieces! This is a simple (Goodwill) frame made into a front door Christmas wreath. 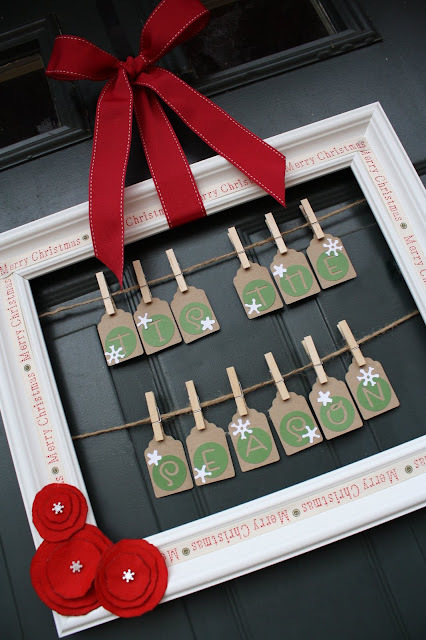 She used ribbon to line the outside of her frame and twine to hang these cute little tags. I LOVE it!! How about this simple embroidery hoop (that you can find at ANY thrift store)... and hang your Christmas cards from clothes pins! Rachel recently had a guest post from her friend, Grace. I am in love with this advent calendar that Grace made! She used some barn wood that she already had and strung out envelopes that can opened each day. So simple and sweet! It's adorable! 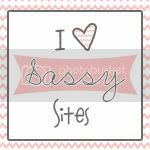 This next idea comes from yours truly at Sassy Sites! I had a shutter in my garage for a couple of months and didn't have any plans to use it. So, one day while searching for something to make a card holder out of... I found my shutters! They make the perfect Christmas card holder display!